1 Be gracious to me, O God, be gracious to me; For in Thee has my soul taken refuge: And in the shadow of Thy wings will I take refuge, Until the [tempest of] destructions is gone by. 2 I will cry to God Most High; To God who accomplishes for me. 3 He will send from heaven, and save me; [For] He that would swallow me up blasphemes. Selah. God shall send His Loving-kindness and His Troth. 4 My soul is among lions; I must lie down among those who breathe out fire-- Sons of men, whose teeth are spear and arrows, Their tongue a sharp sword. 5 Exalt Thyself above the heavens, O God, Above all the earth Thy glory. 6 A net have they prepared for my steps: They have bowed down my soul: They have digged before me a pit; They have fallen into the midst of it. Selah. 7 Steadfast is my heart, O God, steadfast is my heart: I will sing and harp. 8 Awake, my glory; awake, harp and lute: I will wake the dawn. 9 I will give Thee thanks among the peoples, O Lord: I will harp to Thee among the nations. 10 For great unto the heavens is Thy Loving-kindness, And unto the clouds Thy Troth. 11 Exalt Thyself above the heavens, O God, Above all the earth Thy glory. This psalm resembles the preceding in the singer's circumstances of peril and in his bold faith. It has also points of contact in the cry, "Be gracious," and in the remarkable expression for enemies, "Those that would swallow me up." It has also several features in common with the other psalms ascribed by the superscriptions to the time of the Sauline persecution. Like Psalm vii. are the metaphor of lions for enemies, that of digging a pit for their plots, the use of glory as a synonym for soul. The difficult word rendered "destructions" in ver. 1 connects this psalm with Psalm lv. 11, dated as belonging to the time of Saul's hostility, and with Psalms v. 9 and xxxviii. 12, both traditionally Davidic. There is nothing in the psalm against the attribution of it to David in the cave, whether of Adullam or Engedi, and the allusions to lying down among lions may possibly have been suggested by the wild beasts prowling round the psalmist's shelter. The use in ver. 1 of the picturesque word for taking refuge derives special appropriateness from the circumstances of the fugitive, over whose else defenceless head the sides of his cave arched themselves like great wings, beneath which he lay safe, though the growls of beasts of prey echoed round. But there is no need to seek for further certainty as to the occasion of the psalm. Baethgen thinks that it can only have been composed after "the annihilation of the independence of the Israelite state," because the vow in ver. 9 to make God's name known among the nations can only be the utterance of the oppressed congregation, which is sure of deliverance, because it is conscious of its Divine call to sing God's praise to heathens. But that vow is equally explicable on the assumption that the individual singer was conscious of such a call. There is no very sharp division of parts in the psalm. A grand refrain separates it into two portions, in the former of which prayer for deliverance and contemplation of dangers prevail, while in the latter the foe is beheld as already baffled, and exuberant praise is poured forth and vowed. As in Psalm liv. and often, the first part begins with an act of faith reaching out to God, and strengthening itself by the contemplation of His character and acts. That energy of confidence wins assurance of help, and only after that calming certitude has filled the soul does the psalmist turn his eye directly on his enemies. His faith does not make him oblivious of his danger, but it minimises his dread. An eye that has seen God sees little terror in the most terrible things. The psalmist knows that a soul which trusts has a right to God's gracious dealings, and he is not afraid to urge his confidence as a plea with God. The boldness of the plea is not less indicative of the depth and purity of his religious experience than are the tender metaphors in which it is expressed. What truer or richer description of trust could be given than that which likens it to the act of a fugitive betaking himself to the shelter of some mountain fastness, impregnable and inaccessible? What lovelier thought of the safe, warm hiding-place which God affords was ever spoken than that of "the shadow of Thy wings"? Very significant is the recurrence of the same verb in two different tenses in two successive clauses (1 b, c). The psalmist heartens himself for present and future trust by remembrance of past days, when he exercised it and was not put to shame. That faith is blessed, and cannot but be strong, which is nurtured by the remembrance of past acts of rewarded faith, as the leaves of bygone summers make rich mould for a new generation of flowers. When kites are in the sky, young birds seek protection from the mother's wing as well as warmth from her breast. So the singer betakes himself to his shelter till "destructions are gone by." Possibly these are likened to a wild storm which sweeps across the land, but is not felt in the stillness of the cave fortress. Hidden in God, a man "heareth not the loud winds when they call," and may solace himself in the midst of their roar by the thought that they will soon blow over. He will not cease to take refuge in God when the stress is past, nor throw off his cloak when the rain ceases; but he will nestle close while it lasts, and have as his reward the clear certainty of its transiency. The faith which clings to God after the tempest is no less close than that which screened itself in Him while it raged. Hidden in his shelter, the psalmist, in ver. 2, tells himself the grounds on which he may be sure that his cry to God will not be in vain. His name is "Most High," and His elevation is the pledge of His irresistible might. He is the "God" (the Strong) who accomplishes all for the psalmist which he needs, and His past manifestations in that character make His future interventions certain. Therefore the singer is sure of what will happen. Two bright angels--Loving-kindness and Troth or Faithfulness their names--will be despatched from heaven for the rescue of the man who has trusted. That is certain, because of what God is and has done. It is no less certain, because of what the psalmist is and has done; for a soul that gazes on God as its sole Helper, and has pressed, in its feebleness, close beneath these mighty pinions, cannot but bring down angel helpers, the executants of God's love. The confidence expressed in ver. 2 is interrupted by an abrupt glance at the enemy. "He that would swallow me up blasphemes" is the most probable rendering of a difficult phrase, the meaning and connection of which are both dubious. If it is so rendered, the connection is probably that which we have expressed in the translation by inserting "For." 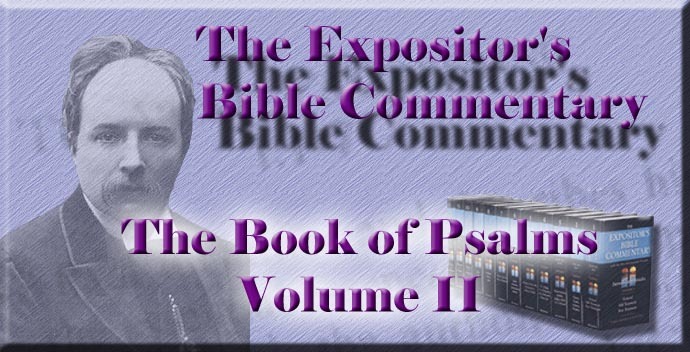 The wish to destroy the psalmist is itself blasphemy, or is accompanied with blasphemy; and therefore God will surely send down what will bring it to nought. The same identification of his own cause with God's, which marks many of the psalms ascribed to the persecuted David, underlies this sudden reference to the enemy, and warrants the conclusion drawn, that help will come. The Selah at the end of the clause is unusual in the middle of a verse; but it may be intended to underscore, as it were, the impiety of the enemy, and so corresponds with the other Selah in ver. 6, which is also in an unusual place, and points attention to the enemy's ruin, as this does to his wickedness. The description of the psalmist's circumstances in ver. 4 presents considerable difficulty. The division of clauses, the force of the form of the verb rendered I must lie down, and the meaning and construction of the word rendered "those who breathe out fire," are all questionable. If the accents are adhered to, the first clause of the verse is "My soul is among lions." That is by some--e.g. , Delitzsch--regarded as literal description of the psalmist's environment, but it is more natural to suppose that he is applying a familiar metaphor to his enemies. In v. 4 b the verb rendered above "I must lie down" is in a form which has usually a cohortative or optative force, and is by some supposed to have that meaning here, and to express trust which is willing to lie down even in a lion's den. It seems, however, here to denote objective necessity rather than subjective willingness. Hupfeld would read lies down (third person), thus making "My soul" the subject of the verb, and getting rid of the difficult optative form. Cheyne suggests a further slight alteration in the word, so as to read, "My soul hath dwelt"--a phrase found in Psalm cxx. 6; and this emendation is tempting. The word rendered "those who breathe out fire" is by some taken to mean "those who devour," and is variously construed, as referring to the lions in a, taken literally, or as describing the sons of men in c. The general drift of the verse is clear. The psalmist is surrounded by enemies, whom he compares, as the Davidic psalms habitually do, to wild beasts. They are ready to rend. Open-mouthed they seem to breathe out flames, and their slanders cut like swords. The psalmist's contemplation of his forlorn lair among men worse than beasts of prey drives him back to realise again his refuge in God. He, as it were, wrenches his mind round to look at God rather than at the enemies. Clear perception of peril and weakness does its best work, when it drives to as clear recognition of God's help, and wings faithful prayer. The psalmist, in his noble refrain, has passed beyond the purely personal aspect of the desired deliverance, and wishes not only that he may be shielded from his foes, but that God would, in that deliverance, manifest Himself in His elevation above and power over all created things. To conceive of his experience as thus contributing to God's world-wide glory seems presumptuous; but even apart from the consideration that the psalmist was conscious of a world-wide mission, the lowliest suppliant has a right to feel that his deliverance will enhance the lustre of that Glory; and the lowlier he feels himself, the more wonderful is its manifestations in his well-being. But if there is a strange note in the apparent audacity of this identification, there is a deep one of self-suppression in the fading from the psalmist's prayer of all mention of himself, and the exclusive contemplation of the effects on the manifestation of God's character, which may follow his deliverance. It is a rare and lofty attainment to regard one's own well-being mainly in its connection with God's "glory," and to desire the latter more consciously and deeply than the former. It has been proposed by Hupfeld to transpose vv. 5, 6, on the ground that a recurrence to the description of dangers is out of place after the refrain, and incongruous with the tone of the second part of the psalm. But do the psalmists observe such accuracy in the flow of their emotions? and is it not natural for a highly emotional lyric like this to allow some surge of feeling to run over its barriers? The reference to the enemies in ver. 6 is of a triumphant sort, which naturally prepares for the burst of praise following, and worthily follows even the lyrical elevation of the refrain. The perfects seem at first sight to refer to past deliverances, which the psalmist recalls in order to assure himself of future ones. But this retrospective reference is not necessary, and the whole description in ver. 6 is rather to be taken as that of approaching retribution on the foes, which is so certain to come that the singer celebrates it as already as good as done. The familiar figures of the net and pit, by both of which wild animals are caught, and the as familiar picture of the hunter trapped in his own pitfall, need no elucidation. There is a grim irony of events, which often seems to delight in showing "the engineer hoised with his own petard"; and whether that spectacle is forthcoming or not, the automatic effects of wrongdoing always follow, and no man digs pits for others but somehow and somewhen he finds himself at the bottom of them, and his net wrapped round his own limbs. The Selah at the end of ver. 6 calls spectators to gather, as it were, round the sight of the ensnared plotter, lying helpless down there. A slight correction of the text does away with a difficulty in ver. 6 b. The verb there is transitive, and in the existing text is in the singular, but "He has bowed down my soul" would be awkward, though not impossible, when coming between two clauses in which the enemies are spoken of in the plural. The emendation of the verb to the third person plural by the addition of a letter brings the clauses into line, and retains the usual force of the verb. The psalmist has done with the enemies; they are at the bottom of the pit. In full confidence of triumph and deliverance, he breaks out into a grand burst of praise. "My heart is fixed," or "steadfast." Twice the psalmist repeats this, as he does other emphatic thoughts, in this psalm (cp. vv. 2, 4, 8, 9). What power can steady that fluttering, wayward, agitated thing, a human heart? The way to keep light articles fixed on deck, amidst rolling seas and howling winds, is to lash them to something fixed; and the way to steady a heart is to bind it to God. Built into the Rock, the building partakes of the steadfastness of its foundation. Knit to God, a heart is firm. The psalmist's was steadfast because it had taken refuge in God; and so, even before his rescue from his enemies came to pass, he was emancipated from the fear of them, and could lift this song of praise. He had said that he must lie down among lions. But wherever his bed may be, he is sure that he will rise from it; and however dark the night, he is sure that a morning will come. In a bold and beautiful figure he says that he will "wake the dawn" with his song. The world-wide destination of his praise is clear to him. It is plain that such anticipations as those of ver. 9 surpass the ordinary poetic consciousness, and must be accounted for on some special ground. The favourite explanation at present is that the singer is Israel, conscious of its mission. The old explanation that the singer is a king, conscious of his inspiration and divinely given office, equally meets the case. The psalmist had declared his trust that God would send out His angels of Loving-kindness and Troth. He ends his song with the conviction, which has become to him matter of experience, that these Divine "attributes" tower to heaven, and in their height symbolise their own infinitude. Nor is the other truth suggested by ver. 10 to be passed over, that the manifestation of these attributes on earth leads to their being more gloriously visible in heaven. These two angels, who come forth from on high to do God's errands for His poor, trusting servant, go back, their work done, and are hailed as victors by the celestial inhabitants. By God's manifestation of these attributes to a man, His glory is exalted above the heavens and all the earth. The same thought is more definitely expressed in Paul's declaration that "to the principalities and powers in heavenly places is known by the Church the manifold wisdom of God."